In PlasticityLab, a variety of techniques are used to study synaptic function and synaptic plasticity, including in vitro brain slice electrophysiology, neuropharmacology, optogenetics, confocal imaging, behavioural assays, molecular probes and mouse genetics. These techniques are currently in use to investigate changes in synaptic plasticity and neuronal physiology in the hippocampal formation following manipulations to disrupt neuromodulatory signalling during development. 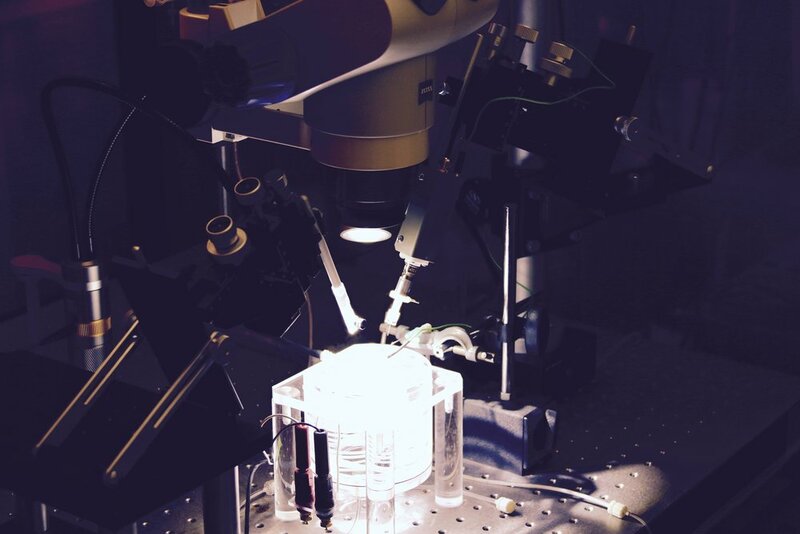 Brain slices for electrophysiological recordings are cut using a vibrating blade microtome. 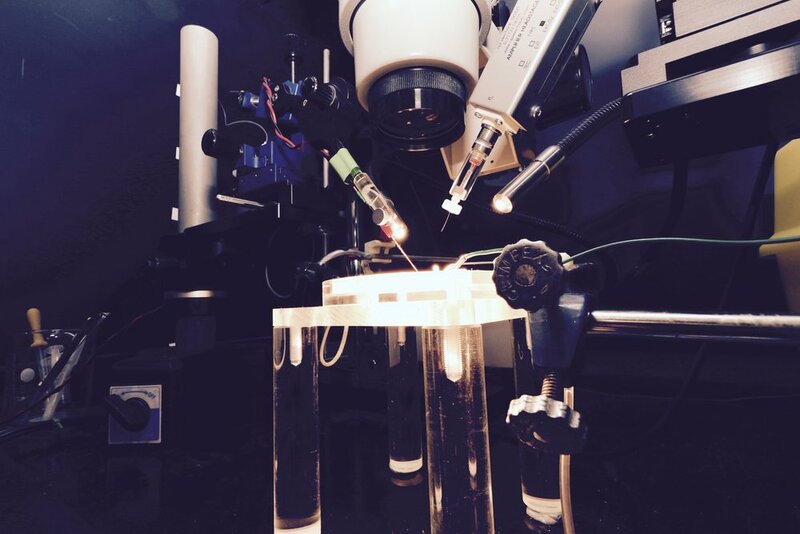 Slices of living brain tissue are maintained in a special chamber, and individual neurons are visualised using an upright microscope equipped with specialised optics and a video camera. A glass pipette filled with a solution that mimics the intracellular medium is used to gently break the membrane of the cell to permit electrical access to its interior. 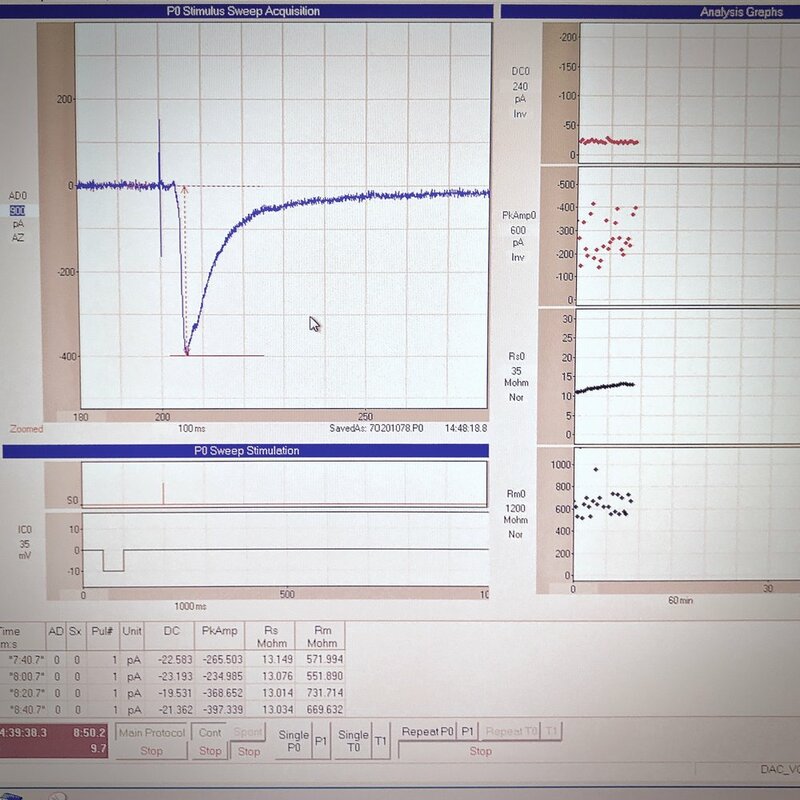 Changes in membrane potential are monitored in response to current injected directly into the cell via the patch recording pipette. In addition, synaptic potentials or synaptic currents can be evoked using a stimulating electrode positioned close by. Pharmacological agents are delivered to the slice by adding them to the bathing medium or by loading them into the cell via the patch recording pipette. Delivery of patterned stimulation can also be used to induce activity-dependent forms of synaptic plasticity. Schematic diagrams along the top highlight the locations of stimulating and recording electrodes in the hippocampus for visualised whole cell experiments (a, area CA2; b, area CA1). Screen grabs of DIC images of actual electrode positions in the hippocampus are shown below. Inset images are of an expanded view of the tip of the recording electrode (yellow boxes) showing the individual pyramidal neurons for intracellular recordings. Whole cell current and voltage clamp recordings. In this example, stimulation of Schaffer collateral inputs from hippocampal area CA3 evokes excitatory postsynaptic currents recorded at the soma of a single pyramidal neuron in area CA2 (a). Changes in basal synaptic transmission can be assessed following application of pharmacological treatments or after delivery of patterened stimulation to the Schaffer collaterals to induce activity-dependent long-term synaptic potentiation or depression. Additionally, depolarizing or hyperpolarizing current can be injected directly into a cell via the recording electrode to induce changes in the resting membrane potential (b). In this example, injection of positive current induces the cell to fire action potentials. 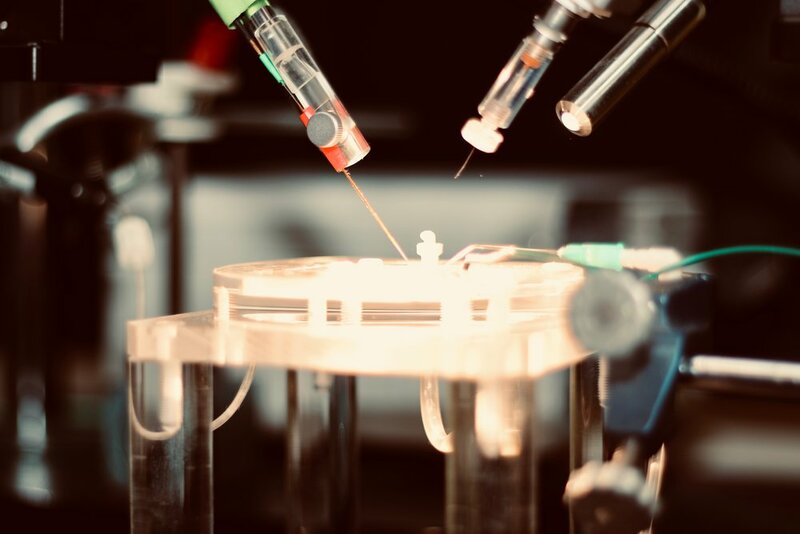 Slices of living brain tissue are submerged on top of a nylon net and are maintained by the continuous perfusion of heated artificial cerebrospinal fluid. A dissecting microscope is used to position electrodes for performing sharp intracellular recordings or extracellular field potential recordings. Sharp recordings are made by impaling single neurons with a high-resistance glass electrode to record synaptic or intrinsic neuronal activity. Field potentials are generated by the simultaneous activity of many neurons and are recorded extracellularly using a low resistance glass electrode placed directly into the slice. Synaptic responses are evoked by placing a stimulating electrode a short distance away from the recording electrode, and pharmacological agents can be delivered to the slice via the bathing medium. Similar to whole-cell recordings, delivery of patterned stimulation is also used to induce activity-dependent forms of synaptic plasticity. Different patterns of electrical stimulation delivered to Schaffer collateral projections to area CA1 induce bidirectional changes in synaptic efficacy in the hippocampus. Bidirectional changes in synaptic efficacy are mediated, in part, by changes in levels of intracellular calcium and surface expression of AMPA receptors (a). High-frequency stimulation (100 Hz for 1 sec) induces long-term synaptic potentiation (LTP) in area CA1 of the hippocampus (b, green). The slope of field excitatory postsynaptic potentials (fEPSPs) is significantly enhanced following tetanic stimulation to induce LTP (b, green arrow, HFS). In contrast, prolonged low-frequency stimulation of the Schaffer collaterals (1 Hz for 15 min; b, red arrow, LFS) induces long-term synaptic depression (LTD) in CA1. Confocal imaging offers several advantages over more traditional widefield microscopy, including precise control over depth of field, attenuation of background noise, and the ability to collect serial sections through thick specimens. 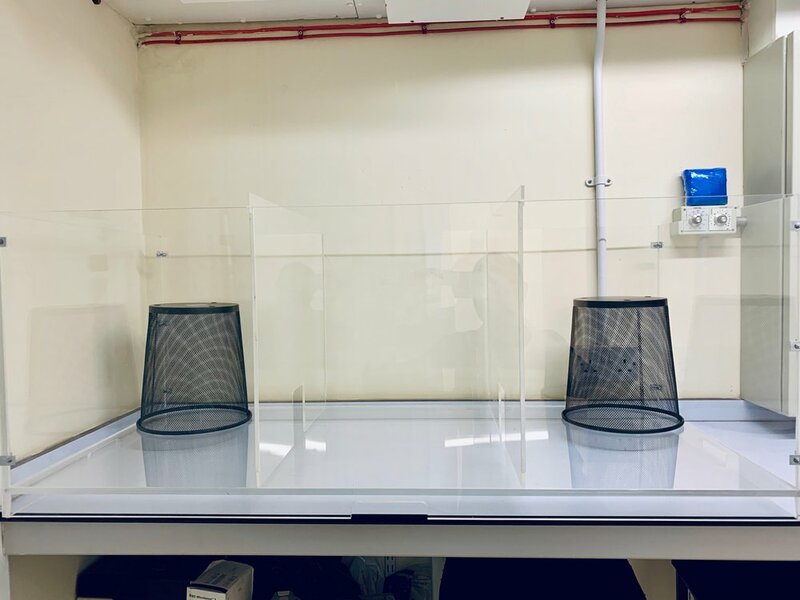 In particular, spatial filtering is used to eliminate out-of-focus light or glare in specimens whose thickness exceeds the immediate plane of focus. This produces images of exceptional quality. The ability to image structural changes in spines following an experimental manipulation is a powerful tool in plasticity research. In situ hybridisation for Pcp4 mRNA transcripts in the hippocampus (shown in pink). Note the high expression in area CA2 and in the dentate gyrus. In Situ Hybridization (ISH) is a technique that allows for precise localisation of a specific segment of nucleic acid within a histologic section. The underlying basis of ISH is that nucleic acids, if preserved adequately within a histologic specimen, can be detected through the application of a complementary strand of nucleic acid to which a reporter molecule is attached. Visualisation of the reporter molecule permits the localisation of DNA or RNA sequences in a heterogeneous cell populations, including brain tissue samples. A useful technique for identifying specific molecules in an array of tissues in the body. Tissue Samples are treated with antibodies that bind to specific molecules of interest. 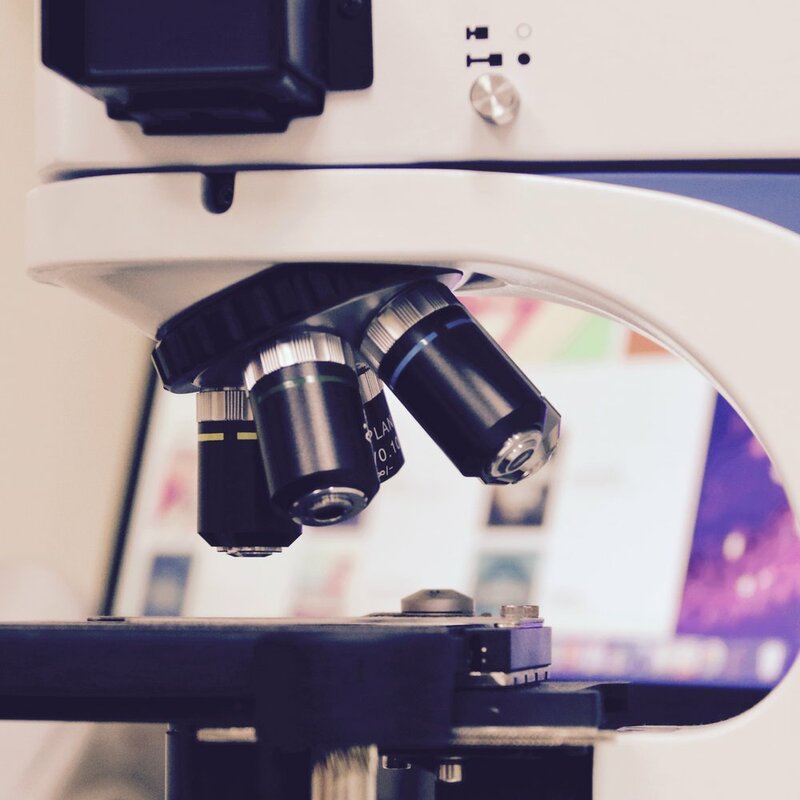 Further treatments are applied to make the tissue visible under a standard light or fluorescent microscope, including DAB or fluorescent reporters. Immunohistochemistry is especially useful for labeling many different types of receptors and proteins in neurons. The lateral entorhinal cortex receives dense dopaminergic innervation from the VTA. Dopaminergic neurons located in the A10 region of the ventral tegmental area (VTA) project to a number of sites within the brain, including the lateral entorhinal cortex (LEC; a). An antibody against the enzyme tyrosine hydroxylase (TH) was used to label dopmainergic cell bodies and fibers. Cell bodes in the VTA positive for TH are shown in b. The schematic diagram in c shows an expanded view of the parahippocampal cortices, including the lateral entorhinal cortex. Note the presence of TH-positive fibers that wrap around principal cell ‘islands’ in layer II of the lateral entorhinal cortex (highlighted in red in d). A number of behavioural testing paradigms are used in PlasticityLab to explore specific types of cognition in animals. Behavioural tests are administered routinely to assess memory for objects, locations or even littermates! Quantification of behaviour is a powerful method for assessing specific forms of cognition in animals. In the examples shown above (top, video sample; bottom, summary data), the movement of rats exploring in an open arena is tracked and recorded (a & b) using specialised monitoring equipment and software. A number of behaviours are assessed, including speed of movement (c), distance travelled (d) and time spent in various locations (e.g., the central region) within the arena (e).